Keep a detailed record of all the unfortunate accidents that occur in your workplace with our Accident Report Book. Presented in a portable size, ideal for quickly grabbing when incident occurs, this functional book has dedicated blocks on the cover for clear identification of date and number in sequence. Each sheet within this report book has been organised providing separate areas for each essential piece of information while easily tearing away using pre-cut perforations for efficient filing. 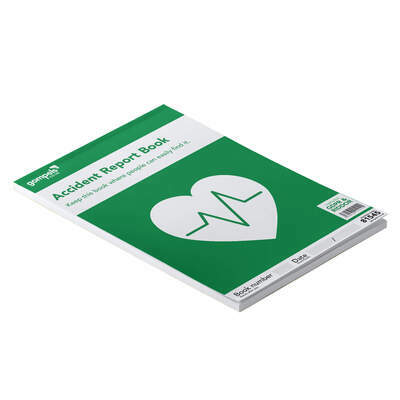 Essential to all work environments and clearly laid out to ensure universal understanding, add these functional report books to your First Aid and Stationery store today. Ensure your first aid boxes are fully stocked up with our First Aid and Medical Supplies with everything from Bandages to Plasters.